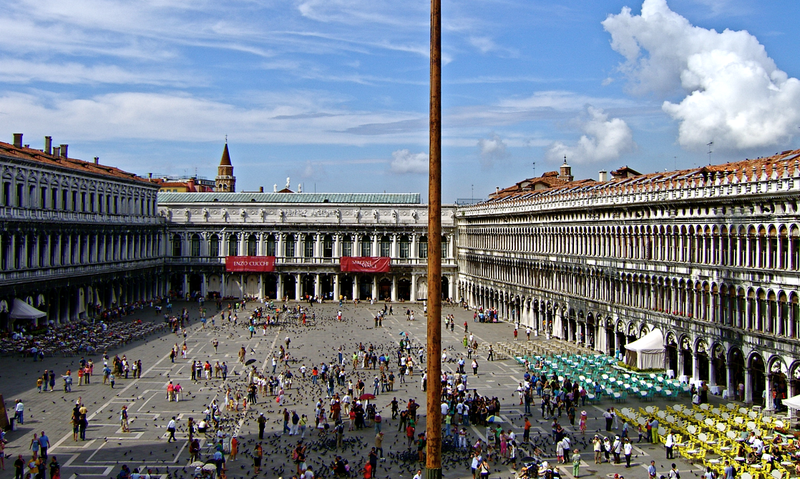 The Palazzo dei Procuratori (15th-16th century) stretches out on the left (south) and right (north) of the church, as viewed here from above the entrance to San Marco. Napoleon added the two-story wing opposite (to the west), to complete the Piazza, in an architectural manner which unites the flanking wings in height, but not strict design. A basic principle involved here - that of empathetic relationships without adherence to blind copying from another time. There is so much more interest and beauty as a result. 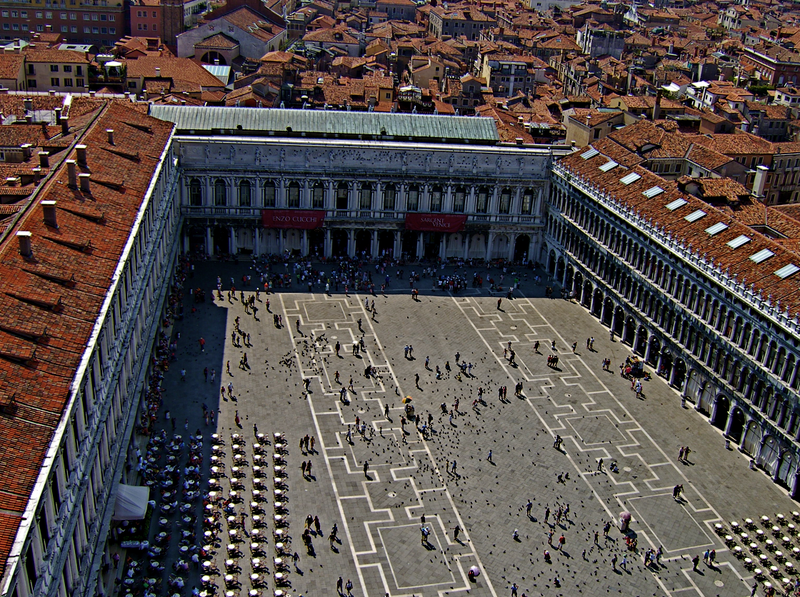 When viewed from above it becomes obvious that the Piazza, at times known in english as “St. Mark's Square” is not at all square or even a parallelogram. Officially, we can call it a “trapezium,” which is a quadrilateral figure with no sides parallel. That is what really makes it subliminally less static, more interesting, as well as more exciting. Dimensions are roughly: from the Campanile westtward 140 meters (460'); the north-south dimension at the Campanile 73 meters (240'); the Napoleonic addition fronting on the Piazza 46 meters (150'). Contrast this irregularly-shaped public space with the Plaza Mayor in Madrid, which is a most regular rectangle, measuring 120 meters long and 90 meters wide (394 x 295 feet), an area almost identical to Saint Mark's “Square.” I find that Plaza, because of its obvious and therefore predictable regularity, rather dull, certainly boring by comparison. The white on almost-black pattern in the paving becomes evident at this scale, and its design is independent of the edges of the Piazza. 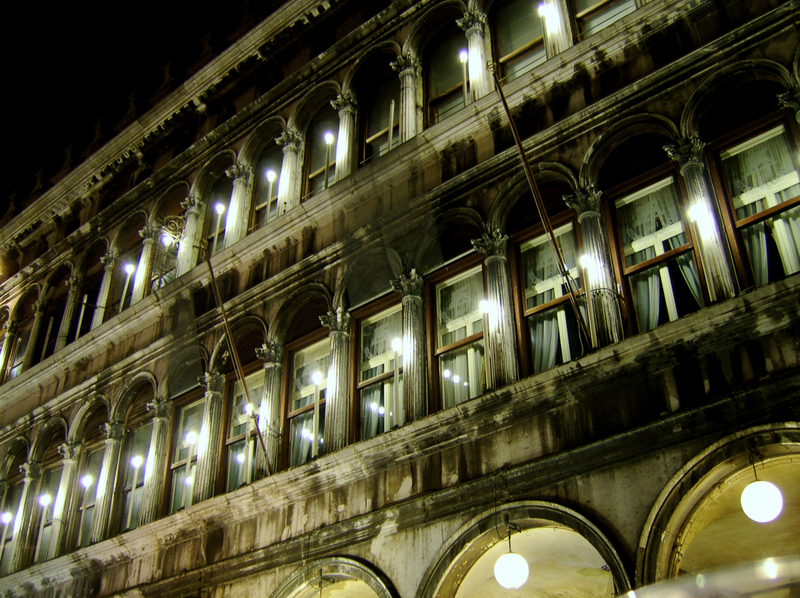 It was designed by a Venetian architect Andrea Tirali in 1723. We will have more to say in our second semester. 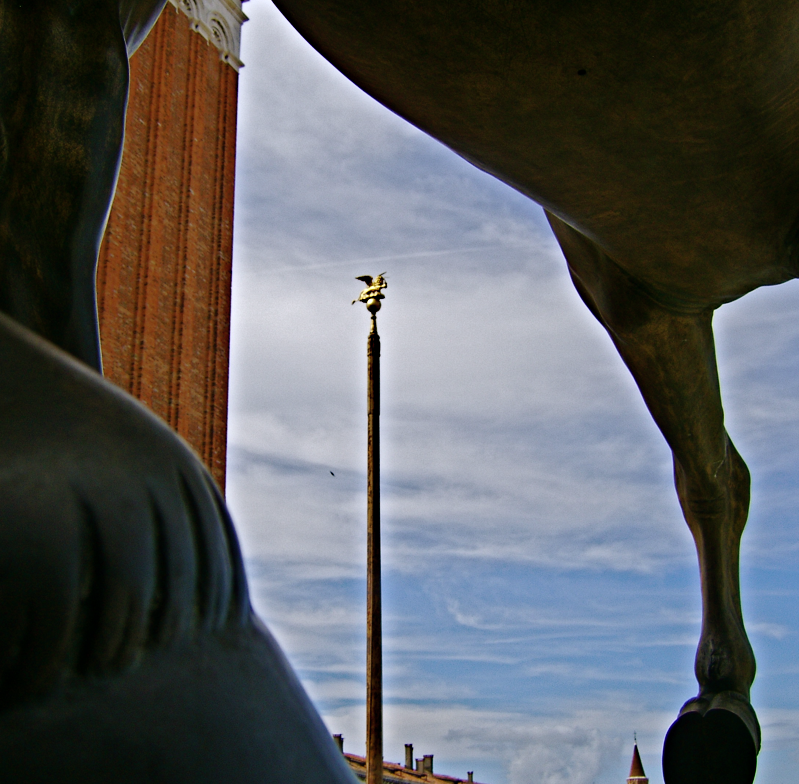 A striking view of the bronze head of one of the four horses (a copy) juxtaposed against the brick and marble of the Campanile. 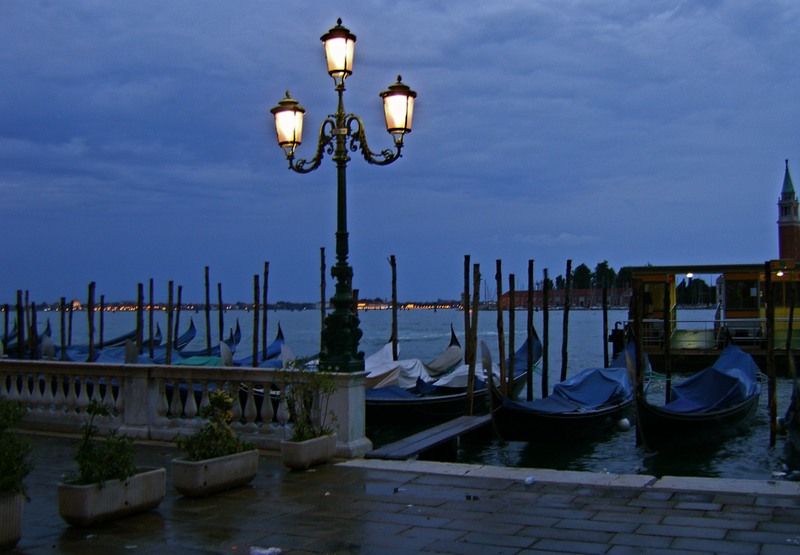 Even the flagpoles are crafted works of art, adding still more visual delight to the ambiance that is Venice. They also, albeit subliminally, help define the space below. 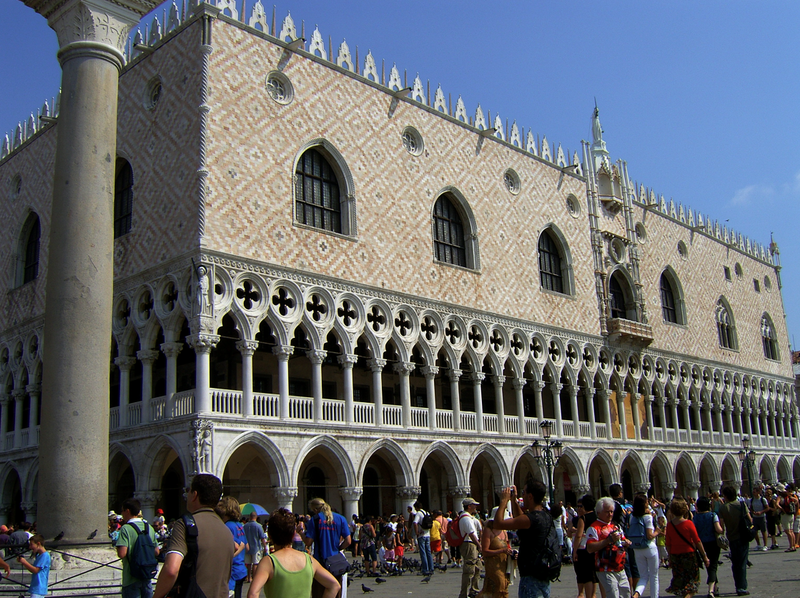 Rose and white marble, in brick-like patterns provide the facade of the Doge's Palace (Ducal Palace- home of the Chief Magistrate). 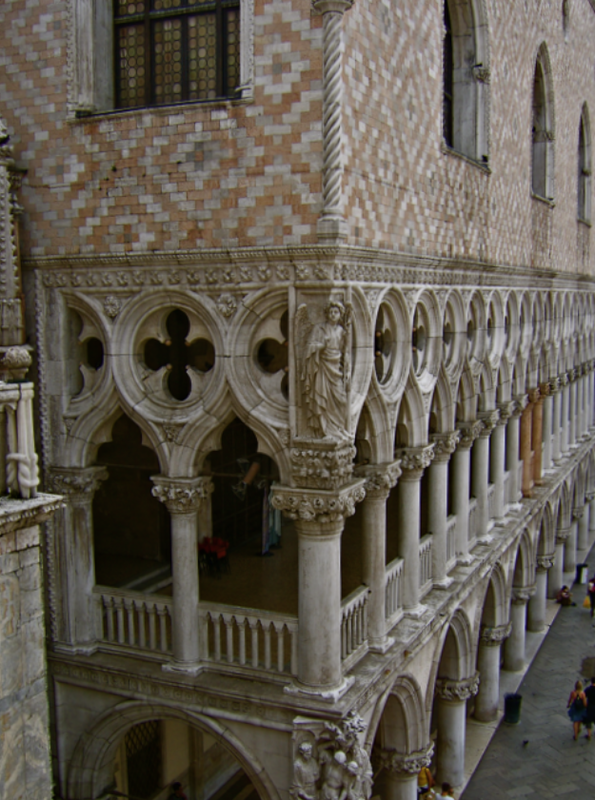 The building is Venetian Gothic, dating back to 1309, with work continued to 1424 (facades); interiors sometimes later. 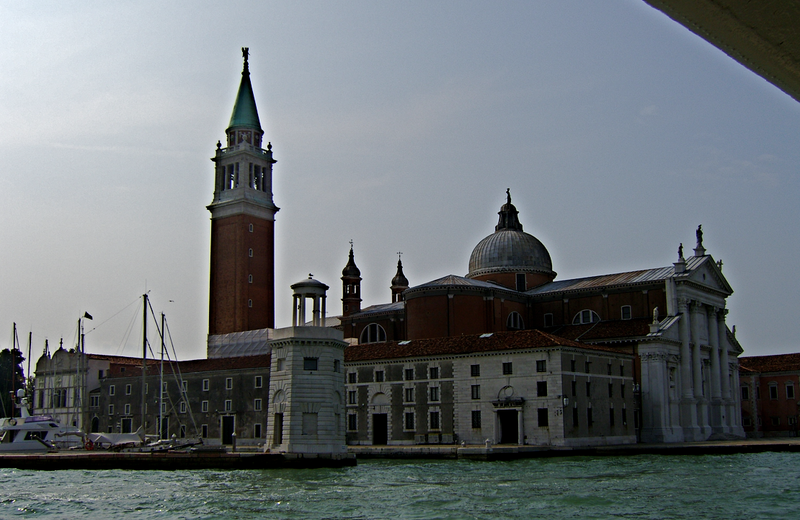 The facade totals 152 meters (500') in length, continuing here from San Marco, and continuing along the lagoon.. The building was started in the 9th century, and rebuilt. It houses ambassadorial and reception chambers, court room - and in this latter capacity, leads to the adjacent prison (see "Bridge of Sighs" below). The Palazzo dei Procuratori at night, presents a most striking image – a lot of chiaroscuro. 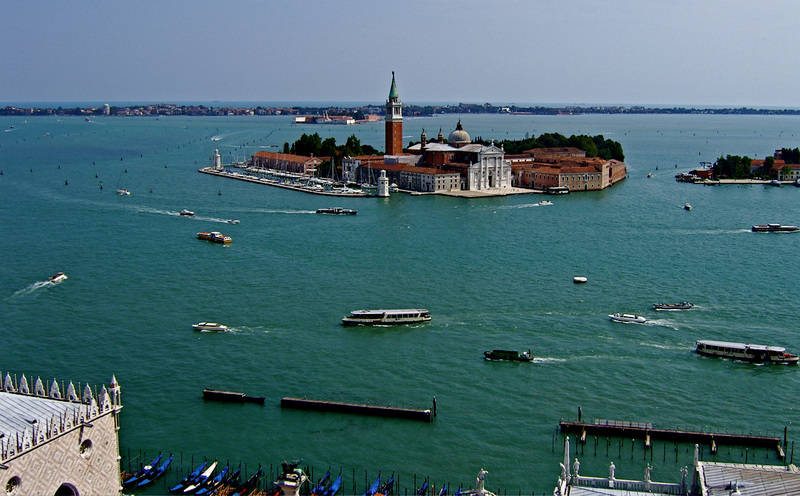 Across the lagoon, on an island, which sort of protects the many islands comprising Venice, is San Giorgio Maggiore. 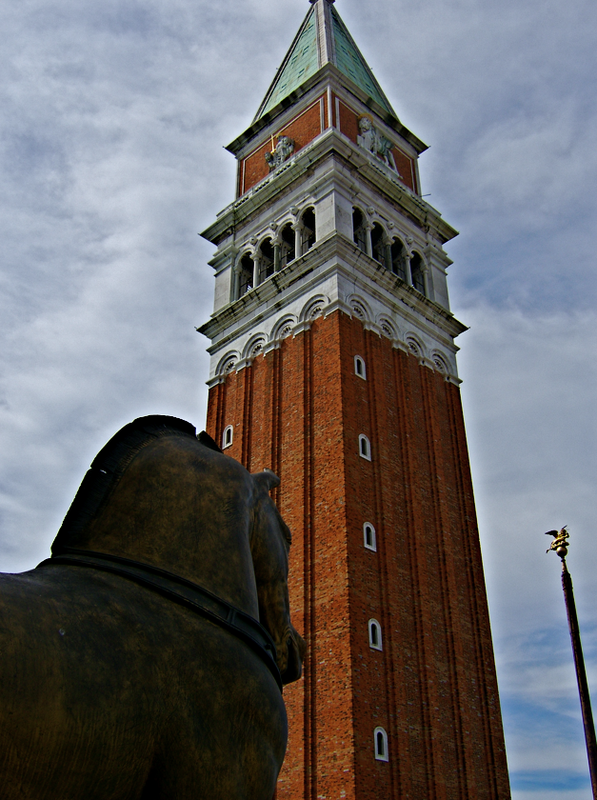 The church and campanile are by Palladio, dating from 1565. 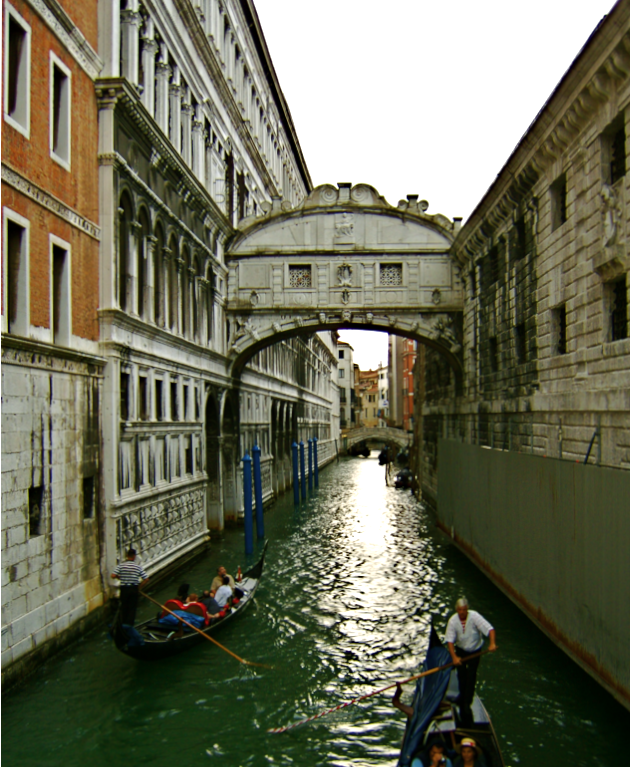 The promised "Bridge of Sighs," so-called because condemned prisoners would be given an opportunity to have a final embrace with loved ones, prior to being herded into their cells. Naturally, everyone involved would utter a "sigh!" 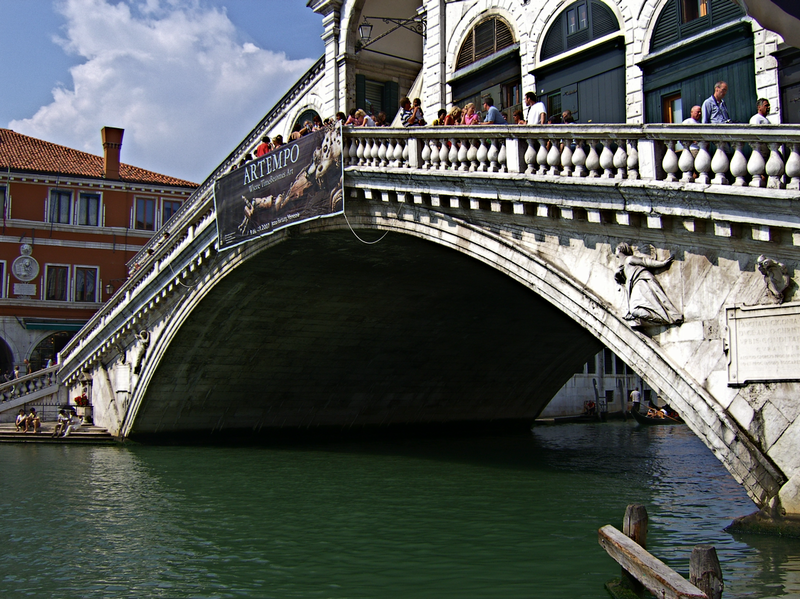 Taking a ride in a gondola, passing under this bridge, is one of the most beautiful experiences anywhere. The photograph was taken from the Ponte de la Pagia, which runs parallel and next to the lagoon. 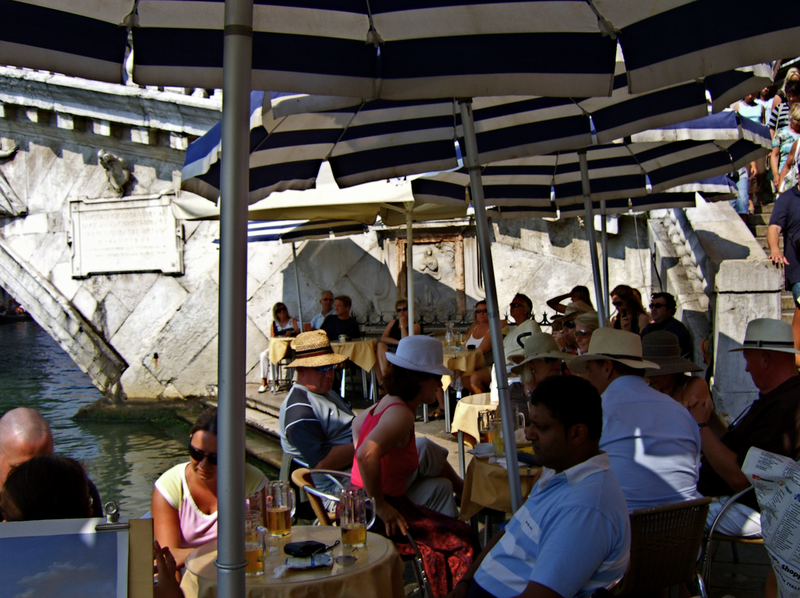 There is no getting away from it - Venice is romantic, and there is food and drink absolutely everywhere. And if the beauty so very visible is not enough, the stories from the past add just another touch. 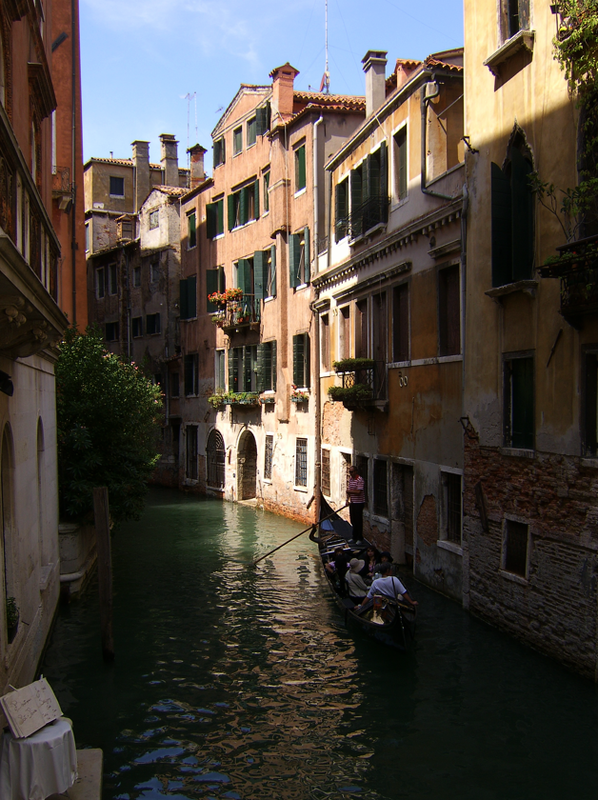 Gondoliers love to talk about the house of Casanova, while gently gliding their craft past the romantic hero's home. This is not the house, but it is on one of these canals. 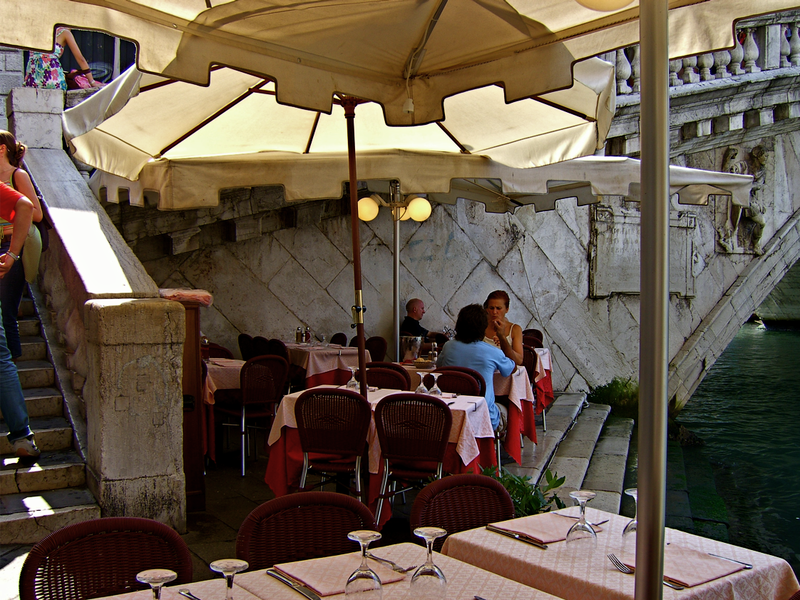 As for picking up principles with which we can enhance our own living situations, look how every available inch of space is put to wonderful use - this niche is practically under the Rialto Bridge; aside from the fact that the entire city is a veritable work of art. This is the other side of the bridge, in the event you might have wondered where the crowds were. I was saving the bridge itself for our second semester – but, well, here it is. 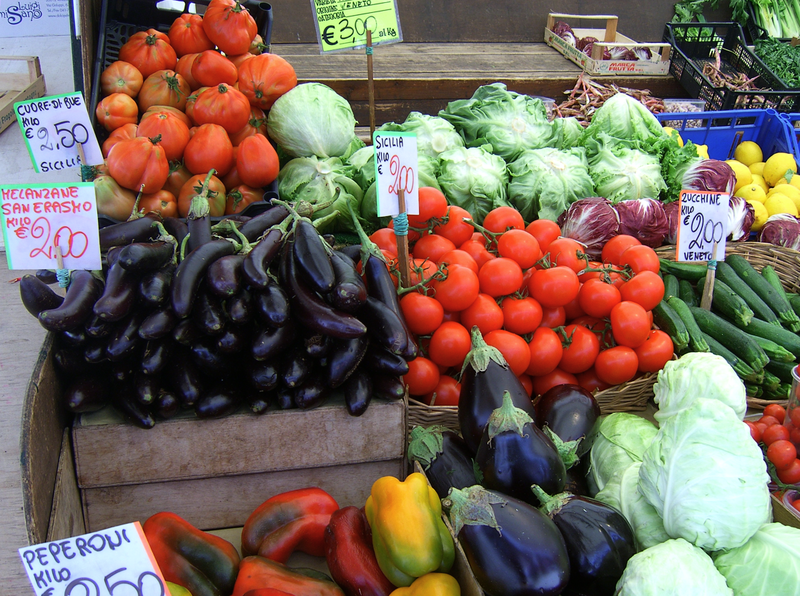 And the vegetables, sold out of doors, seem so very fresh, and create a most colorful palette. 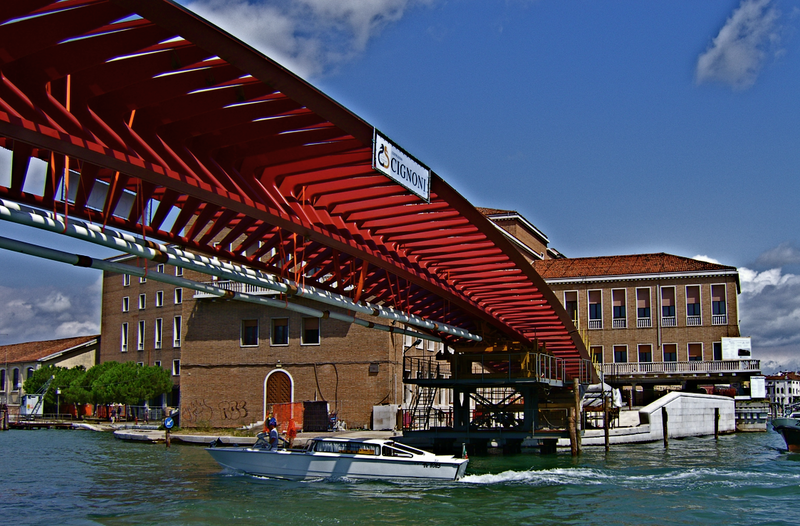 The newest bridge, the fourth, to span the Grand Canal, actually put in place the day before this photograph was taken. Designed by Santiago Calatrava, it links the Piazzale Roma (car and bus terminus from the mainland) with the railway station. 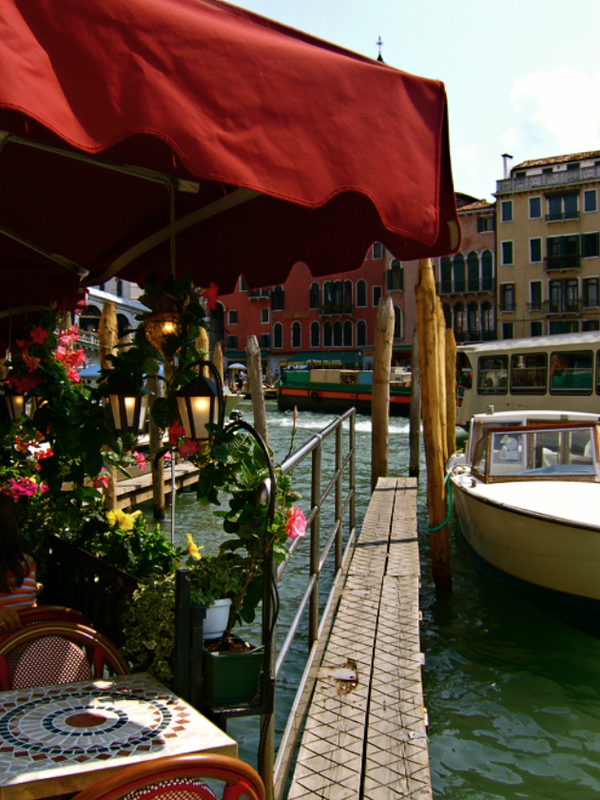 And as a bit of summation - what you should be noticing is that Venice doesn't seem to be composed of buildings or construction materials, but of delicate items of jewelry, beautifully and delicately hand-crafted into one magnificent integrated entity. There is a feeling of totality composed of so many fine details because the overall effect is of a sumptuous feast for the eyes. And one more thing – everything is scaled to human beings – a lesson taught by the Art Deco preservationists in South Beach, who brought about the renaissance of Miami Beach, and by Edmund Bacon (Chief Planner, and creator of the first “Master Plan” for an American city post World War II) in Philadelphia with his resurrection of Society Hill. Among many other such transformations, these two are worthy of further study.